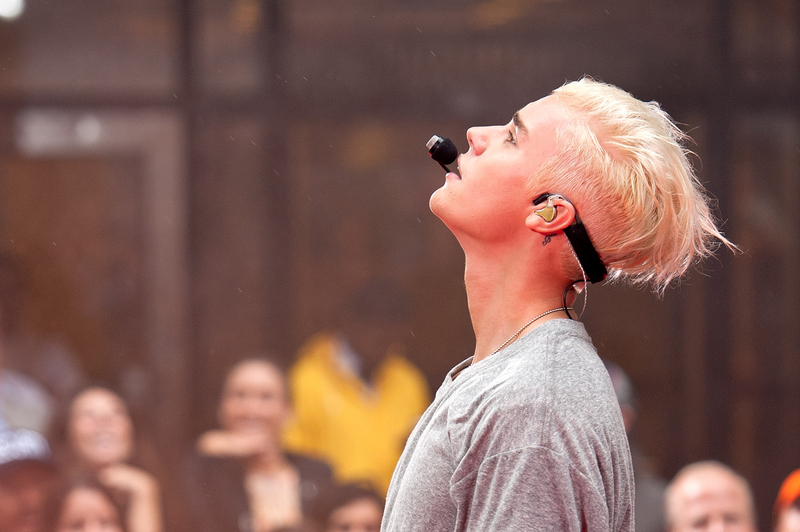 In case you missed it, the Biebs debuted some pretty wild new hair this morning. Yep, Justin Bieber dyed his hair platinum blonde, and it's definitely a look you haven't seen on him before. The usually-brunette singer has been famous for his hair since he emerged on the music scene 2007, but this is a (kind of cool) departure. Justin debuted his hair on The Today Show this morning to a crowd of screaming fans. Trust me, they were excited about his new look. I could hear the screams from the 19th floor of my office building, which is next to Rockefeller Center. I'll give Justin one thing — his platinum hair has clearly been taken care of by a professional. It's perfectly lightened and (so far) root-free, and he's got a good amount of volume for hair that's probably pretty damaged from being exposed to bleach. After I saw the pictures of Justin, I started to think that his look was a little familiar. After all, platinum blonde hair is majorly trending right now, and it seems like a new celeb jumps on the bandwagon every week. I like to imagine Justin took a lookbook of these celebs to his hair appointment and shamelessly copied their effortless platinum style. This one is obvious. No one does white-blond better than Felton (circa his Harry Potter days), and Justin's hair is distinctly Malfoy-esque. While no one will ever dethrone the Felton as king of the platinum blond throne, Justin is giving him a run for his money. The British actress has never shied away from severe fashions and haircuts, despite her incredibly strong cheekbones. She somehow pulls it off flawlessly, and the Biebs can only hope to be compared to Swinton. When the normally brunette reality star went blonde earlier this year, jaws around the world dropped. Justin's 'do didn't quite get the attention Kim's did, but it's pretty close. Both are famous for being brunette, so the shock factor of Justin's change definitely mirrors Kim's. I think Jared Leto could really be the reason why the Biebs went blonde. I mean, look at him. Platinum perfection. OK, the Donald isn't actually blonde, his hair is more of a white/orange combo. But people couldn't resist making the comparison between Justin's flyaway combover and Trump's signature look. I'll give Justin the benefit of the doubt this time and assume the windy conditions on stage may have messed with his hair, but let's hope he doesn't repeat this look.